After a year of the life with the iPad, there are unquestionably some apps that have changed how and what we do on-the-go. But when it comes to blogging, the options have remained limited in both quantity and quality. QuickTumblr from MOApp Software is a new entry in the field that hopes to raise the bar a little. As you may have inferred from the name, QuickTumblr is built specifically for Tumblr, the super-simple blogging service that is exploding in popularity (as of January, it did 1.2 billion pageviews in a week and was growing by 250 million each week). While Tumblr got its name for making it easy to post animated GIFs and “reblog” (or simply quote) your favorite posts from other Tumblr users you follow, it’s also becoming the short- and long-form multimedia blogging service of choice for many, thanks to its polished and flexible nature. Enter QuickTumblr, a new Tumblr client that focuses on penning text posts, but eschews the other post types that Tumblr supports, such as links, chats, or videos. You can write in HTML or Markdown, use your TextExpander snippets, and take advantage of custom keyboard and formatting tools to craft posts. In addition, you can add photos from the camera roll or Safari, and there’s support for sending your post to Tumblr’s queue for scheduled publishing, saving drafts, toggling Twitter publishing, and posting to multiple group blogs. Thanks to iOS’s inter-app file sharing, you can also easily send text, HTML, or Markdown files from other apps to QuickTumblr as posts, ready to edit and publish. By design, QuickTumblr is not a full Tumblr client like the service’s official iPhone app. There is no Twitter-like Tumblr dashboard in QuickTumblr for following, liking, and reblogging posts from other users. If anything, QuickTumblr is more of a blog authoring utility, a sort of “MarsEdit for Tumblr” on iPad. 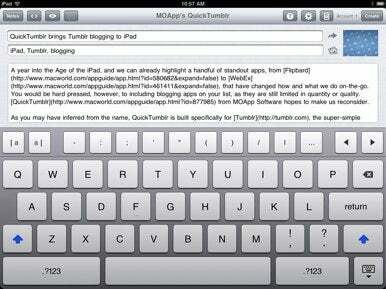 You grab a copy of QuickTumblr for $3, and your iPad will need to have iOS 4.2 or later.